The quilt top has grown since the last time we talked about it. I added another row consisting of two huge blocks each made up of four smaller blocks. Although it’s taken me forever to post about it, this was all accomplished within a couple of hours of sewing and pressing. 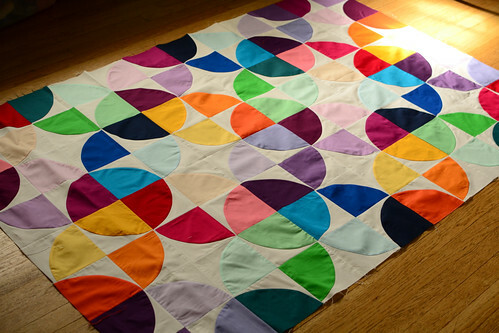 Seriously, easiest quilt ever. I’m hoping the people taking my class tonight feel that way about it, too. I’ve scaled it down a bit for them because this size (50 x 75 inches) might be a tad too big to be a crib quilt. It might also prove to be a bit easier to quilt at a smaller size for someone doing their first quilt. We’ve also put together some bundles of fabrics to make this quilt outside of the class available at gather here. The pattern will be ready by the end of the month, so I think the bundles and the pattern will be available as a package then. I’ll have more info on that soon, though. wow, what a gorgeous quilt! i love the colors and the design. Oh man, I love this! I hope the pattern will be available on its own, because I have tons of Kona Cotton just screaming to be used in this. Beautiful work! This is the nicest quilt I've seen for a while. It's inspired me so much to drop my dress making projects and get one started. I'm making mine with yarn-dyed plains and a micro dot plain (only as I couldn't get a putty coloured plain). I hope it turns out as fabulous as yours! I'm spreading this love all over Pinterest!